Jamie Hood marked his return from injury with a goal as Leamington turned this Birmingham Senior Cup tie on its head in the last ten minutes to reach the semi-final, writes Paul Edwards. The influential central defender had been badly missed during his eight game spell on the sidelines and his delight was clear for all to see as he thumped a header past former Brakes keeper Niall Cooper from Rob Thompson-Brown’s right-wing corner to level the scores. Courtney Baker-Richardson powered home the winner almost a minute later as Paul Holleran’s side bounced back from their six-goal home humiliation against Slough Town. Stratford had led through Simeon Tulloch’s 25th-minute strike. 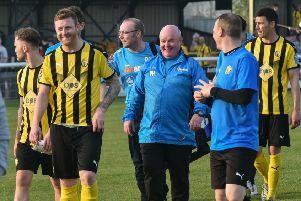 The Leamington boss was unable to utilise his squad as much as he would probably have liked, with Tom James injuring himself in the warm-up, while former Town striker Richard Gregory and Jordan Goddard were both cup-tied. Stratford themselves were hamstrung in the attacking positions, with three strikers cup-tied, but it was Tulloch who bulldozed them in front after a low-key opening, running on to a pass from Liam Francis, outmuscling James Mace and stabbing in a shot that had enough power on it to beat Tony Breeden despite the Leamington skipper getting a hand to the ball. Although still not at their best, Brakes posed far more of a threat than they had done over 90 minutes on Saturday, Baker-Richardson forcing Cooper into a somewhat unorthodox save as he deflected the ball over. The striker attempted an overhead kick from the resulting corner but was off target, before Dan Summerfield laced a long-range drive just over the bar for the visitors. Baker-Richardson got in down the right to fire a powerful effort into the side netting early in the second half, while Stratford came close to a second when Will Grocutt headed against the bar as the ball was played back into the penalty area following Guy Clark’s blocked shot. Ahmed Obeng was introduced for the final half-hour and he immediately made an impact with his direct running pushing the Town defence back. He fired in a shot which was deflected towards the far corner, Cooper scrambling across just in time to claim the ball ahead of Thompson-Brown. There was a brief shout for a penalty when Obeng looked to have been fouled in the box but Leamington were asking more questions of their visitors now, and Cooper pulled off a stunning save to keep out a piledriver from Callum Gittings. Richard Taundry curled a free-kick straight at the Stratford keeper, who then saved well again from a close-range shot from Mace, but he was powerless to stop Hood’s header in the 81st minute. Sixty seconds later the turnaround was complete, Baker-Richardson rising to power a downward header through Cooper and into the net from another Thompson-Brown corner. The former Stratford midfielder could have added further gloss to the scoreline when striking a free-kick on target, but Cooper was in the way once more to punch clear. However, Leamington had done just enough to reach the last four of the Senior Cup for the first time since 2012. Brakes: Tony Breeden, Ben George, Richard Taundry, Darren Pond (Joe Magunda, 69), Jamie Hood, James Mace, Courtney Baker-Richardson, Callum Gittings, Ryan Rowe (Ahmed Obeng, 57), Jack Edwards, Robbie Thompson-Brown. Subs not used: Ryan Quinn, Tom James, Connor Gudger.